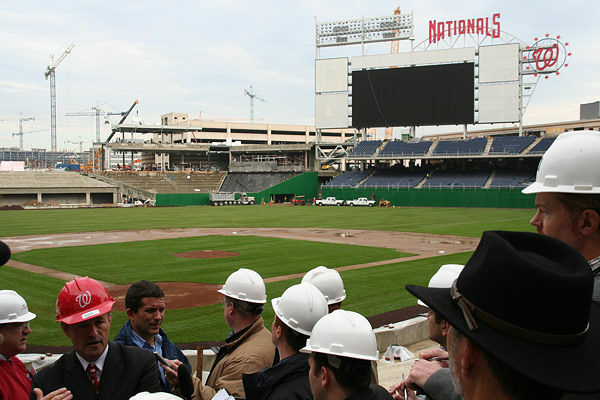 On November 13 the DC Sports and Entertainment Commission, the Nationals, and Clark/Hunt/Smoot held a tour for the media to show off the newly installed turf, and to give the latest news about season tickets and the 2008 schedule. Remember, most of these photos are taken with somewhat wide-angle lenses, which allows for a better view of the surroundings but which distorts sizes and distances. The stadium and the scoreboard are huge in person. 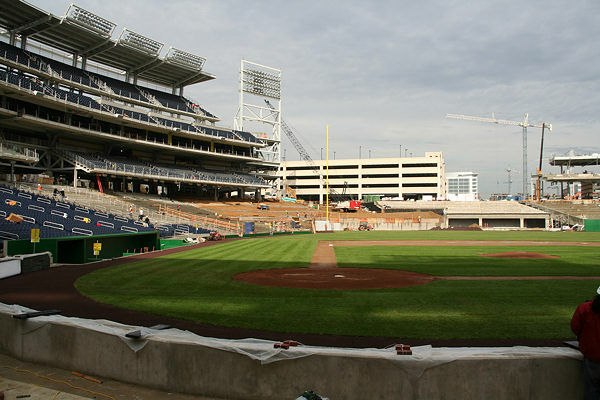 The state of the Nats ballpark on November 13, 2007, as seen from directly behind home plate. 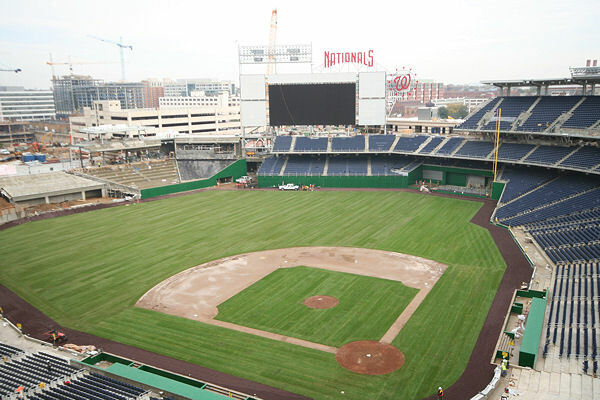 The turf installation began on Nov. 1, and was completed on Nov. 9, the same day that the last HD panel was hung on the scoreboard. I just can't take enough pictures of the scoreboard. The high-definition panels are now all hung. 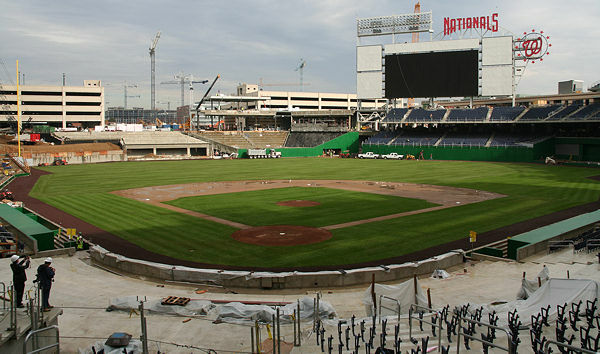 The W at right will be a clock. The white panels will be for advertising displays. 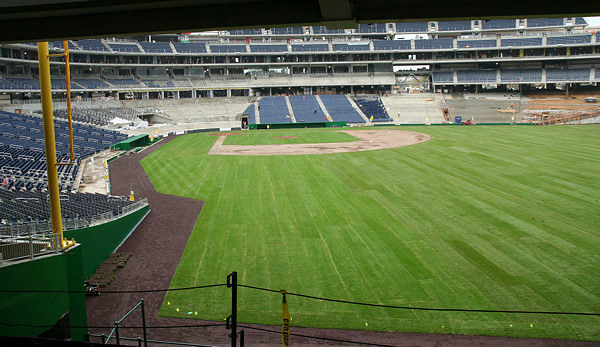 Two stitched-together panoramas showing the ballpark looking in and looking out. To see much larger versions, suitable for studying in minute detail, go here. 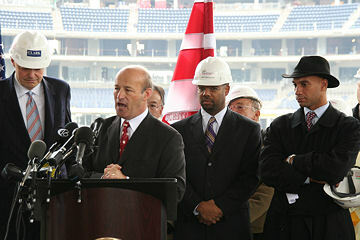 Team president Stan Kasten addresses the media, flanked by Mayor Fenty (right) and representatives from the DC Sports and Entertainment Commission. 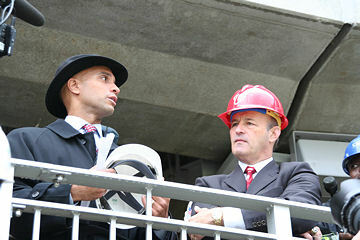 Kasten and Fenty, in the stands behind home plate. The assembled media huddling under the roof of the outfield restaurant, during the initial press briefing. 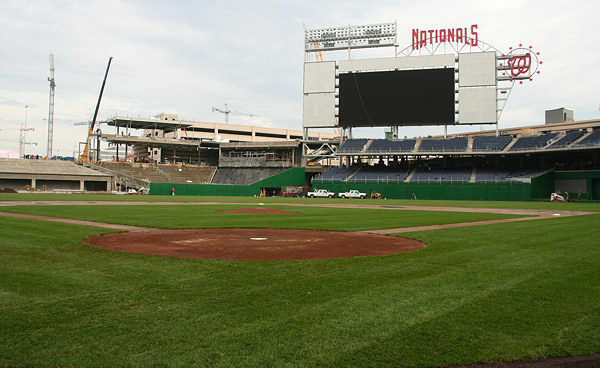 The Nats' dugout, the field, the scoreboard, and the signs threatening immediate death if you even think of venturing out onto the field. 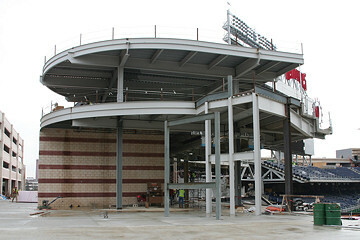 A closeup of the bluestone making up the backstop behind home plate. 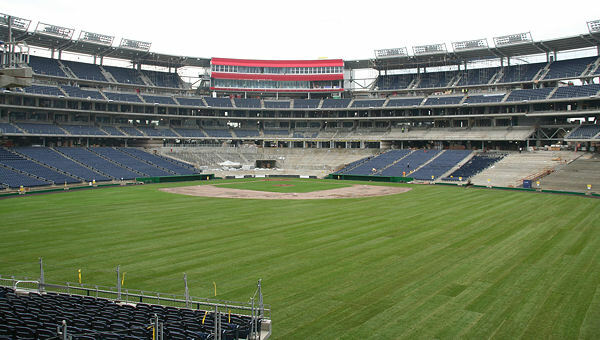 Looking up the third-base line. 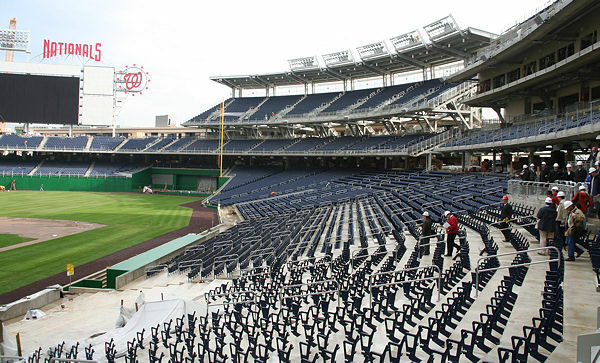 .... And across the first-base line bleachers, as well as the seats still not yet 100-percent installed. 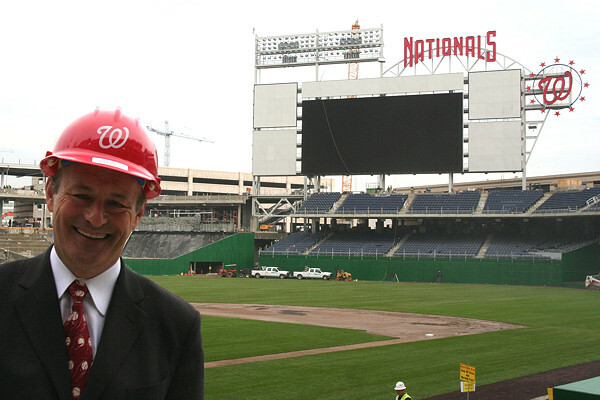 Stan Kasten gives the media the scoop. 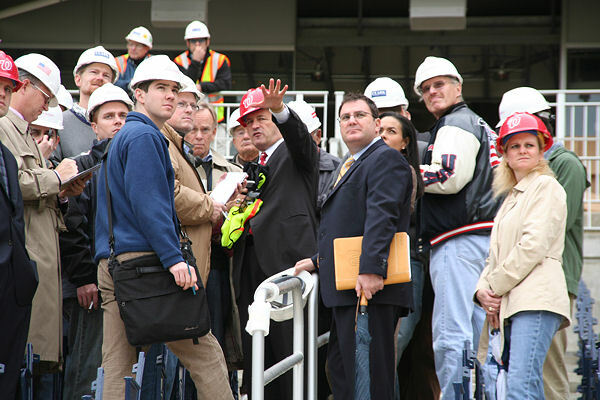 The reverse view, showing the press held spellbound by Stan Kasten. 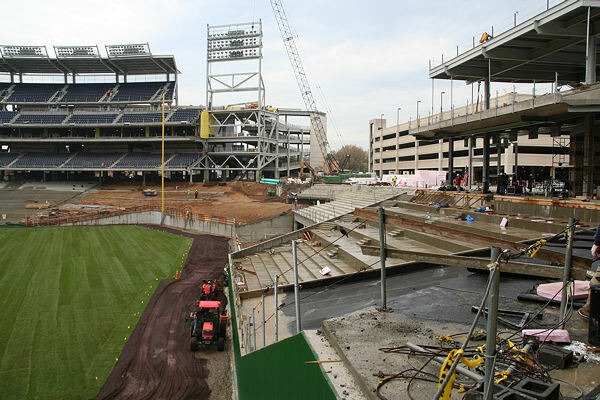 The last real obvious exterior structural work continues along the left-field wall. 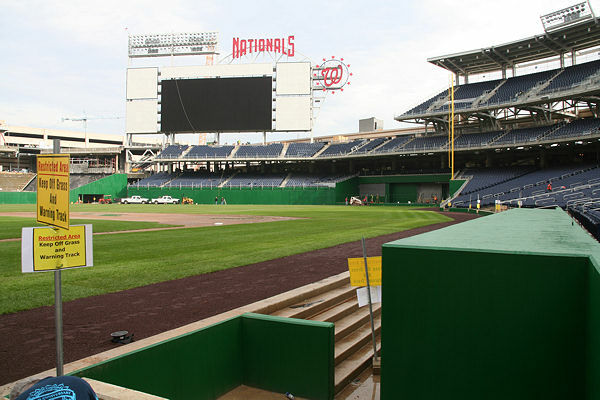 My first close-up view of the outfield restaurant. 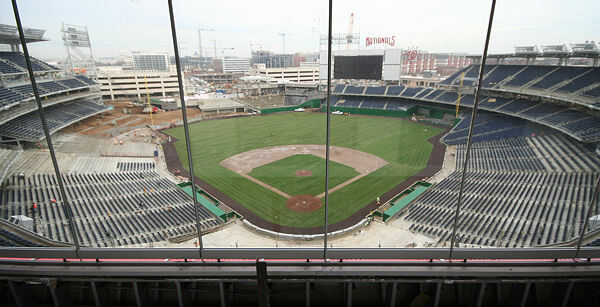 Another view of the scoreboard, from up in the press box (behind dirty glass). 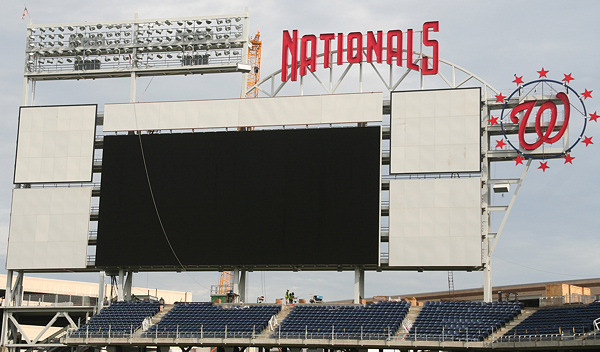 This gives you an idea of how massive the scoreboard is--the little yellow speck just left of center above the scoreboard is a construction worker.